Ever get deja-vu when checking your Bloglines account? And not just for those seemingly endless "five things" memes that go around every so often? While viewing the feed in the right pane, click "edit subscription" above the feed title. Choose "Ignore" next to "Updated Items." Save changes, and you're good to go. Since we announced that Wicked Cool has changed to a blog format, I've gotten some questions about how people will know when it's been updated. Well, at least for a while, I'll send out an email once a month to remind you to look at the new content. But, if you want the newest content (since I'll be posting at least once a week), you may want to consider subscribe using an aggregator like Bloglines. With Bloglines, you still need to check the site to see if there is new content. So, if the only blog you'll ever read is Wicked Cool, then it might not make much sense (since you can just come here instead). But I bet, once you get started with Bloglines, you'll find lots of great blogs to subscribe to, and then you can check them all at once. 2. Click on the "Register" button in the upper left-hand corner. 3. Fill out the registration form, and click "Register"
4. You'll receive an email to the address you registered. Follow the instructions in the email to complete your registration. Congratulation! Now you have your own Bloglines account. 1. Go to the Wicked Cool blog <http://scls.typepad.com/wicked_cool/>, if you aren't there already. 2. 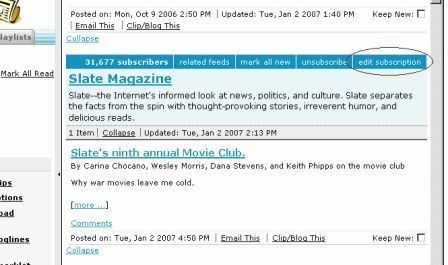 Click the "Subscribe with Bloglines" button (in the right-hand column). 3. If you're not logged into Bloglines, do that now. 4. Then, click the "Subscribe" button at the bottom of the page that appears and .....tada! You're subscribed. Next week, I'll talk about some other blogs you might want to subscribe to.